Last night, Thursday 26 May 2011, saw the Northern Ireland Tourism Board (NITB) Awards, in association with Diageo Northern Ireland, being presented at a Gala Dinner held at the Ramada Plaza Hotel, Belfast. The NITB Awards recognise the work and achievements of the industry and encourage the delivery of excellence for Northern Ireland’s visitors. Ireland & Northern Ireland really are part and parcel of an "Irish Holiday Package" and the sooner that this becomes better integrated into Ireland’s Tourism operators’ international advertising, the better for all involved. Excellent Events - Entries were invited from event, festival or conference organisers, in private, voluntary or public sectors, who can demonstrate significant impact and success in attracting visitors to and entertaining them in Northern Ireland. Taste of Northern Ireland - Non-accommodation sector establishments that provide food and drink to locals and visitors alike. Entrants must demonstrate how they have created a customer-friendly eating experience and use local suppliers and ingredients reflecting the quality of Northern Irelands’ artisan food produce. Hotel Accommodation - Hotel establishments that are committed to excellence in service, customer care and hospitality. Serviced Accommodation - Operators of Bed & Breakfasts, guesthouses and farmhouse establishments. The organisers were looking for operators who are committed to excellence in: service, customer care and hospitality. Non-Serviced Accommodation - Operators of Hostels, self-catering, camping and caravan establishments. Operators who are committed to excellence in service, customer care and hospitality. Best Visitor Experience - Visitor attractions and experiences – including events and tours available on a seasonal or year round basis that can demonstrate their service excellence, customer care and hospitality as well as the quality of their presentation or interpretation. Visitor Inspired - Organisations in private, voluntary or public sectors that can demonstrate the crucial role that staff play in creating happy customers or visitors - providing them with the best customer care and/or quality experience. Entrants are encouraged to provide details of training development or continuous improvement systems and processes and how these align with their business objectives. Marketing & Sales Experience - Private, voluntary or public sectors organisations that have undertaken effective marketing or sales initiatives or campaigns. This category must show proven results that have had a positive impact on their business. Activities should include one or more of the following: promotional campaigns, collaborative marketing, press and PR, web based and/or direct marketing and sales activities. Tourism Partner Initiative - Companies that have undertaken initiatives or projects in partnership with others. These include private and public partnerships, those in same sector activities or part of the supply chain. New Tourism Project - Organisations that have undertaken new projects to improve tourism infrastructure, products or services. These may be individual projects or those delivered in partnership with other providers/bodies. Outstanding Contribution to Tourism - An organisation, person, group or initiative that has made an outstanding contribution to the tourism and hospitality industry in Northern Ireland – This is a Special Award and the recipient is selected by members of the NITB council. This year the organisers decided to ‘keep it more local’ by playing music from local Belfast band General Fiasco http://www.myspace.com/generalfiasco on the PA between presentations - a decision that went down well with all those attending! “Diageo is proud to support the Northern Ireland Tourist Board in the ongoing development of a vibrant tourism and hospitality sector. The Northern Ireland Tourism Awards are key to a thriving tourism industry and the future success of the Northern Ireland economy. Each year the standard of shortlisted entries continue to rise and this year is no exception." Don't forget to Feed the Fish at the bottom of this Post! 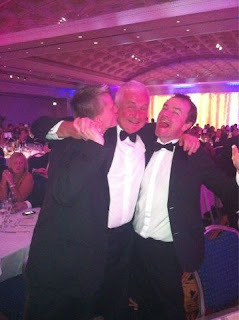 Irish Restaurant Awards 2011 National Finals - Full Results & More ! 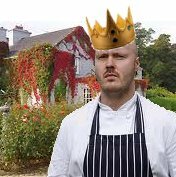 Chapter One scooped the Best Restaurant Award & Mickael Viljanen, Head Chef at Gregans Castle is crowned Best Chef in Ireland! What a Night! A Super Supper was Served! 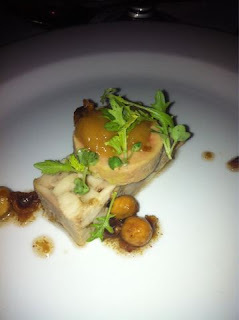 Guests on the night were treated to a five-course menu prepared by the winning Chefs in each of the five regions in 2010. This year’s event saw legends of the Foodie world: Danny Millar (Balloo House), Garret Byrne (Champagne), Seamus Commons (Knockranny House), Paul Flynn (The Tannery) and Eamonn O’ Reilly (One Pico) prepare a sumptuous meal for over 700 guests at a glittering black tie event – a fantastic celebration of all that is great in the Irish Restaurant Industry. The Irish Restaurant Awards are organised by The Restaurants Association of Ireland and are sponsored by Santa Rita & Sunday Independent LIFE Magazine. This year’s event recognized achievement and excellence in the Restaurant and Hospitality Industry, throughout the whole island of Ireland, in 22 categories. The awards celebrate all aspects of the Industry from Chefs, Restaurants, Food Producers, Cookery Schools and even Local Food Heroes! Readers of the Sunday Independent LIFE Magazine and members of the Restaurants Association of Ireland put forward nominations for the awards. The awards process ran from the beginning of February 2011 until the 25th of May 2011 whereby nominated Restaurants faced scrutiny from the Consumer, Regional Judges, a Mystery Guest Visitor and finally the National Awards Academy. The County winners were announced at a number of Regional events, over the last few months, in the run up to the Main Event last night in the Burlington Hotel Dublin. Don’t Forget to Feed the Fish at the bottom of this post! 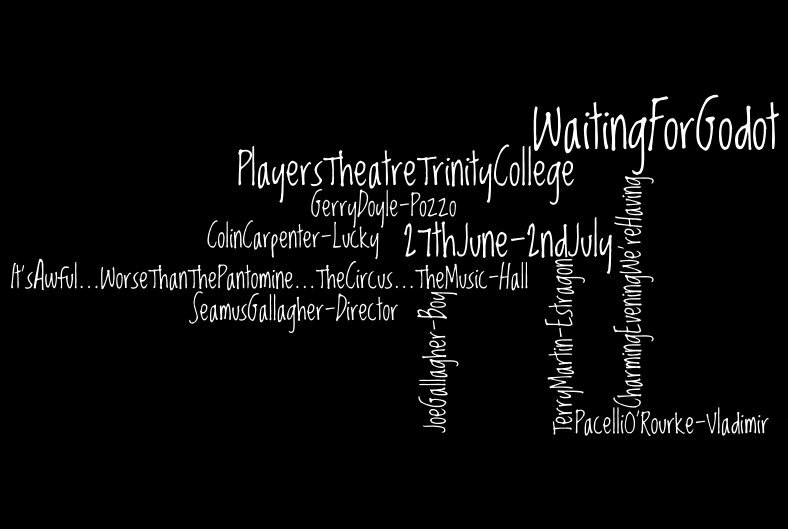 My Brother brings a new production of "Waiting for Godot" to Trinity College ! 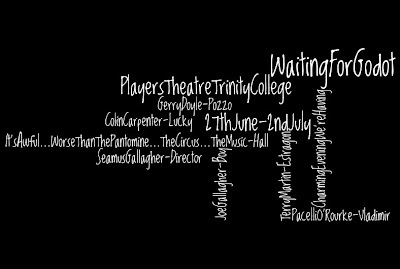 Gerry Doyle as "Pozzo", Colin Carpenter as "Lucky", Terry Martin as "Estragon", Pacellio O'Rourke as "Vladimir" and introducing 10 year old Joe Gallagher as "the Boy"﻿. Waiting for Godot is an absurdist play by Samuel Beckett, in which two characters, Vladimir and Estragon, wait endlessly and in vain for someone named Godot to arrive. Godot's absence, as well as numerous other aspects of the play, have led to many different interpretations since the play's premiere. It was voted "the most significant English language play of the 20th century". Waiting for Godot is Beckett's translation of his own original French version, En attendant Godot, and is subtitled (in English only) "a tragicomedy in two acts". The original French text was composed by Beckett between 9 October 1948 and 29 January 1949. The première was on 5 January 1953 in the Théâtre de Babylone, Paris. The Player's Theatre is housed in same area as the Samuel Beckett Centre within the historic walls of Trinity College Dublin. For over 400 years Trinity has produced some of the world’s great minds across the sciences and the humanities, including two Nobel Laureates, Samuel Beckett in literature and Ernest Walton in science. Literary greats such as Jonathan Swift, Bram Stoker and Oscar Wilde are followed by the creative genius of more recent graduates, such as writers, Michael Longley, Derek Mahon, Anne Enright and Sebastian Barry. Martin Anderson, a native of Donegal, began his career at the then world famous tourism college Killybegs. Graduating in 1986, Martin worked his way around Ireland and then on to Paris, where he completed his training in the prestigious Four star Lotti Hotel. On returning home Martin was appointed head chef at the Errigal hotel, Letterkenny. 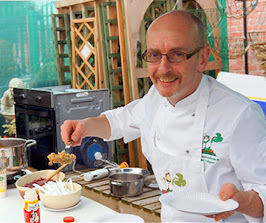 After publishing the Highland Breakfast Cookery Book co written with John Breslin, Martin realised there was a need for a private cookery school in the North West of Ireland. 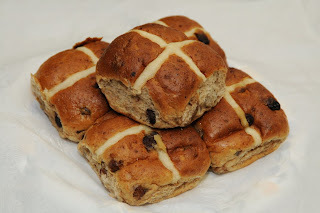 The Crest Cookery School was founded in 2005. In 2008 Chef Martin expanded the catering company with the purchase of a mobile catering Kitchen aptly named the Gourmet Express from which he serves gourmet fast food at festivals, corporate and charity events. Cookery Displays by Martin & his friend (and ex-chef) radio presenter John Breslin are good fun! This recipe from Chef Martin Anderson, is a Thai-style version of the classic steamed mussel dish. Serve it in a large bowl with crusty bread and a glass of your favourite wine it is perfect for sharing at an informal dinner party or even as part of a BBQ. ½ lemongrass stem, finely chopped. 2 red chilli's, seeds removed, thinly sliced lengthways. Remember to wash your hands afterwards when chopping the chilli’s !!! 1 dessert spoon of ginger paste. Donegal Rapeseed oil for cooking. 1. Wash and pick the mussels pulling out the beard. Discard any that are open, tapping on the shell may close them but if they do not close, don’t risk it. 3. 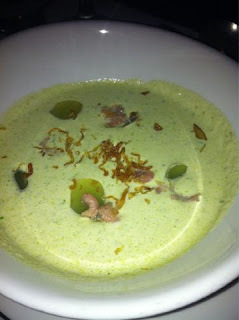 Add the coconut milk and fish sauce, Increase the heat to high and then bring to the boil. 4. Add the mussels and cover with a tight-fitting lid. Steam the mussels, shaking the pan occasionally, for 5 minutes or until opened. Discard any unopened mussels. 5. Stir in the coriander and Serve in a large bowl. Remember to serve the cooking liquid from the pot over the mussels but leave a little in the bottom of the cooking-pot as this is where the sand gathers. Delicious! 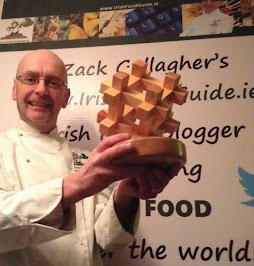 If you, or someone you know, would like to do a Guest Chef Spot on the irishfoodguide blog, please give me a shout! Don't forget to Feed the Fish at the bottom of this post! Hard Comté style cheese made using raw cow’s milk from the Tiernan’s own herd of Montbéliarde cows. 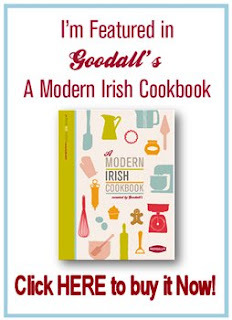 Produced by the Grubb Family in Fethard, Co. Tipperary. Semi-soft blue cheese, made using cow’s milk from their own and selected neighbouring farms. Produced by the Steele Family in Milleens on the Beara Peninsula, Co. Cork. Semi-soft, washed rind cheese made in a classic Munster style from pasteurised cow’s milk. Semi-firm goat’s milk cheese in the classic French Tomme style. Master uilleann piper Liam O’Flynn is from County Kildare and began piping classes aged eleven. As a young man Liam encountered two other giants of Irish piping, Seamus Ennis and Willie Clancy. Along with Dónal Lunny, Liam was one of the founding members of one of Ireland’s legendary bands Planxty. He also attracted an international audience when he recorded Shaun Davey’s The Brendan Voyage a groundbreaking orchestral piece which was followed by Granuaile, The Relief of Derry Symphony and The Pilgrim, all composed by Davey. Other regular collaborators include Nobel Laureate Seamus Heaney with whom Liam has recently recorded The Poet and the Piper. Harpist, Denise Kelly began her musical studies in Dublin and following her graduation from Trinity College, Dublin with a MusB Degree, she moved to London where she studied harp with the renowned Russian harpist Maria Korchinska. She also studied composition and conducting at the Guildhall School of Music and Drama. An Arts Council scholarship enabled her to finish her harp education at the Conservatoire Royale de Musique, Brussels. In 1999 she was appointed as lecturer in harp at the DIT Conservatory of Music & Drama. She has a great interest in contemporary music and is herself a composer and arranger. As a freelance orchestral harpist, she has worked with the N.S.O., RTECO, Orchestra of St. Cecilia, and the Ulster Orchestra. She has recorded solo and chamber music with BBC, RTE, UTV, radio and TV, and has made numerous CDs with the cellist Moya O’Grady and choral group ‘Anuna’. This short performance features many of the most distinctive forms and instruments associated with Irish traditional music. The opening and closing sections include dancers performing several traditional dances with reels, hornpipes and slipjigs. A song entitled ‘Eleanor Plunkett’ and composed by one of Ireland's most famous composers, Turlough O'Carolan, featuring voice and harp, forms the central section. The melody is performed in the sean-nós style (translated as old style) and is a unique element of the Irish tradition. A native of County Clare, fiddle player Tara Breen has won All-Ireland honours on several instruments, including fiddle, concert flute and saxophone. Tara has toured internationally including visits to the Philippines, South Korea, the USA, Germany, Spain and China. In 2005 she travelled with Comhaltas Ceolteoiri Éireann on the All-Britain Tour. Dónal Lunny is considered to be one of the most influential figures in the renaissance of Irish music in the last half-century. Dónal was a founding member of several of the most prominent Irish traditional bands of recent years, including Planxty, The Bothy Band and Moving Hearts. In 2008, he received an Honorary Doctorate in Music from Trinity College, Dublin, and is a member of Aosdána, a self-governing body of Ireland’s most prominent artists. James Mahon is a traditional musician from Dublin who graduated from the DIT Conservatory of Music in 2009 and is a specialist in traditional Irish Music and ethnomusicology. He is the recipient of seven All Ireland titles, across a range of categories. James studied flute under Tom Doorly and June McCormack, and Uilleann Pipes under Joe Doyle. Iarla Ó Lionáird grew up and learned his craft in the musical heartland of Cuil Aodha in the West Cork Gaeltacht. From his iconic early recording of the vision song Aisling Gheal whilst still a boy, he has established himself both as a masterful exponent of sean nós song and as a pioneer in its renewal and development. Iarla has sung in his unique style for audiences across the globe from New York to London and from Cape Town to Moscow, Rome and Tokyo. Originally from County Monaghan, Michael is an internationally recognised and award-winning harper and concertina player, as well as a tutor and composer. His major works include two Aifreann na Geailge masses, The Famine Suite and the Battle of the Books suite. He has recorded two albums together with June McCormack, Land’s End and Draíocht. Maria began dancing at the age of four with the O’Shea School in Dublin, Ireland. She danced competitively and toured extensively with the School, performing from a young age at festivals in Ireland, Europe and America. She began performing with Riverdance in 2004 and since then, has danced with the company in Ireland, Europe, America, Japan and Taiwan. Cal began dancing at the age of nine with Scoil Rince Mona Ni Rodaigh where he quickly advanced, qualifying for the Worlds at the age of thirteen. He has toured extensively with Riverdance all around the world, from places as far and between as Dubai, Beijing and Los Angeles. Padraic joined Riverdance in 1997 and in 2006 was nominated for an Ovation Award for Leading Actor in a Broadway touring Production. He choreographed and performed in the Old Bog Road by Eileen Ivers and has performed with artists including Maria Carey, Shania Twain, The Chieftains, and Ryan O’ Neill. Dublin-born Niamh began dancing at four years of age and has won numerous Leinster, All-Ireland and World championship medals throughout her competitive dancing career. Having started performing with Jurys Cabaret in Dublin when she was ten, Niamh joined Riverdance in 1995 for the world premiere in Dublin. She has toured extensively with the show over the last fifteen years and she holds the record for the most shows performed in Riverdance. With many thanks to Linda Farrell at the Presidents office for her help. 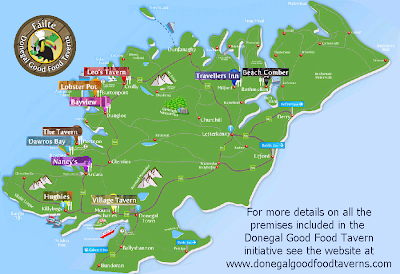 “Donegal Good Food Taverns” to Launch on Monday, May 16th. 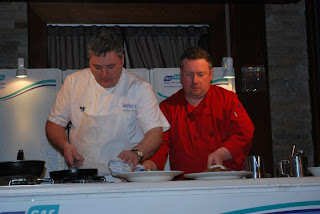 Diligent research always provides results and Enda O’Rourke from the award winning ‘Village Tavern’ in Mountcharles and Hugh O’Donnell from ‘The Seafood Bar’, 22 Main Street, Killybegs, are proof of this point! 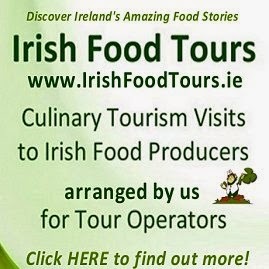 The two catering entrepreneurs realised that good regionally sourced food, served in the casual setting of a bar environment accompanied by traditional music, is one of the main criteria that the touring visitor is looking for in Ireland. in the famous Nancy’s Bar, Ardara on Monday May 16th. “The Very Best of Traditional Locally sourced Foods” is their motto! Their philosophy is to serve up a generous serving of "Donegal on a Plate" using locally sourced seafood, lamb, beef, pork and vegetables, washed down with Irish & Donegal branded whiskeys and McDaid’s flavoured waters. Add to this, the haunting sounds of Donegal musicians, fiddlers and storytellers in the corner of the eating-house and they surely have a recipe for success! They have built an itinerary of traditional Irish music, seven evenings a week at different venues throughout the trail. The participating bars and restaurants have signed up to core principles and will be externally audited to authenticate that all principles are being delivered upon in the proper way! All group pubs have signed up to the sourcing of locally produced ingredients, highlighting freshness and quality. Each Tavern will serve the signature dishes of local Oysters and a selection of genuine Old Irish Recipes on their individual menus. The group has also undertaken to provide a Traditional Music trail 7-nights a week, coupled with cultural nights, coffee making demos, stew making demos and story telling, early-evening and early-night! Their studies found that many foreign tourists are in the habit of getting up earlier than their Irish counterparts and therefore the group decided to start the entertainment earlier for their enjoyment. This, I think, is a good idea. Far too many music sessions in Ireland, that are put on primarily for the visiting tourists, start much too late even for some of the musicians! 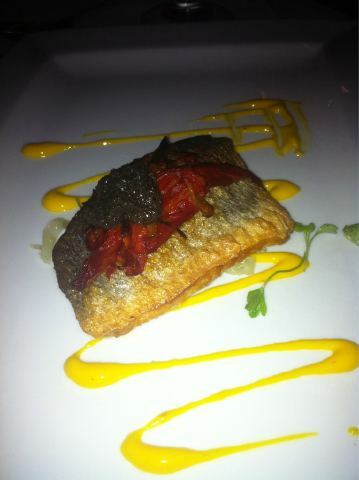 The Seafood Bar, 22 Main Street, Killybegs. Dawross Bay Hotel, Narin & Portnoo. The Donegal Good Food Taverns group are working alongside the cream of Donegal’s artisan food producers so that they can showcase each other- the producer, the retailer and the entertainer! Some of the local food producers included in the program are: Filligans Chutneys, Burtonport Sea Veg, McDaid’s flavoured waters, Tyrconnel whiskeys & Donegal Rapeseed Oils. Local fishermen, honey producers, cheesemakers, our own garden vegetables, oysters from Donegal Bay, home baked breads and desserts are to be prominent on all the menus. Any other local food producers that wish to get involved can contact any of the members. The group’s website went Live this week and will eventually link in with Failte Ireland's "Place on a Plate" programme, Facebook "Places" Project, the Tourism College Killybegs, LYIT Letterkenny and the Donegal County Enterprise board’s own food programme "Donegal Coastal Food". After a day taking in the sights of what this diverse and beautiful county has to offer, an evening in one of these Donegal Good Food Taverns would be the near perfect end to a perfect day! Simon Coveney - a man with a Fire in his Belly !